Lips, Grecaman, Chz & Big Sal Black of the Brooklyn Bred Hip Hop Family the 67 Mob finally return to the spotlight. After expanding both their buzz and credibility with their album “Raising the Bar”, which featured such legendary hip hop veterans like Kool G Rap, AZ, Buckshot and Canibus, to name a few. The Bensonhurst Boys are back with another Hip Hop offering for their loyal fans and new recruits. “T.I.M.E.” (Things I Must Earn) features another cast of hip hop heavyweights the likes of Joel Ortiz, Sean Price and even the Blast Master himself KRS-1 makes an appearance. 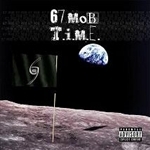 67 Mob’s “T.I.M.E.” is set to be debuted March 29th.